Optical Physics Company personnel have been researching speckle-based imaging technologies for over 25 years and have invented four generations of imaging techniques. The most recent project in this domain is sponsored by the U.S. Air Force Office of Scientific Research (AFOSR) under the Small Business Technology Transfer Research (STTR) Phase II contract FA9550-10-C-0012. During the first phase of the recent project, OPC demonstrated the feasibility of its speckle image processing approach for conformal sub-aperture arrays through analysis, simulation and laboratory demonstration. The technique demonstrated is not only completely immune to boundary layer turbulence but also mitigates atmospheric turbulence. It can achieve 7.5 cm resolution at 100 km range, seven times better than the boundary layer turbulence limit for airborne imagery. OPC has recently completed a successful field test in cooperation with California State University at Northridge (CSUN). The test is being conducted across a 1-km horizontal path using an eye-safe 1.55-micron laser and a fast frame NIR camera with a 0.5-m receiving aperture. Test setup geometry with target site is shown below. 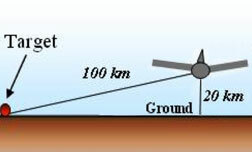 The target is about 1 km. away. 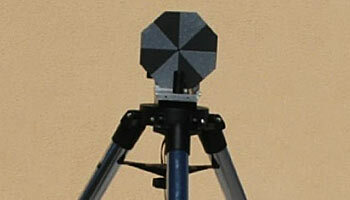 The target site has a pinwheel image mounted on a tripod as shown below. A preliminary result of the field test is shown below. The processed image shows test target well and provides features for resolution measurement. The operational scenario we envision for this system is shown below. The system consists of one or more laser illuminators and a conformal receiver array with multiple sub-apertures. The laser illuminator is capable of covering a 90 degree field of regard with current liquid crystal capability. The conformal receiver array hugs the curve of the fuselage in any convenient area. It is a square, round or elliptical array about 2 meters in size to achieve 7.5 cm resolution at 100-km range. Different geometries can be constructed based on the need and space availability. The overall system meets all requirements for diffraction-limited resolution. Flying at an altitude of 6 km or higher, the system can image a target 100 km away at a resolution of 7.5 cm. One potential platform for this system is the Global Hawk UAV.